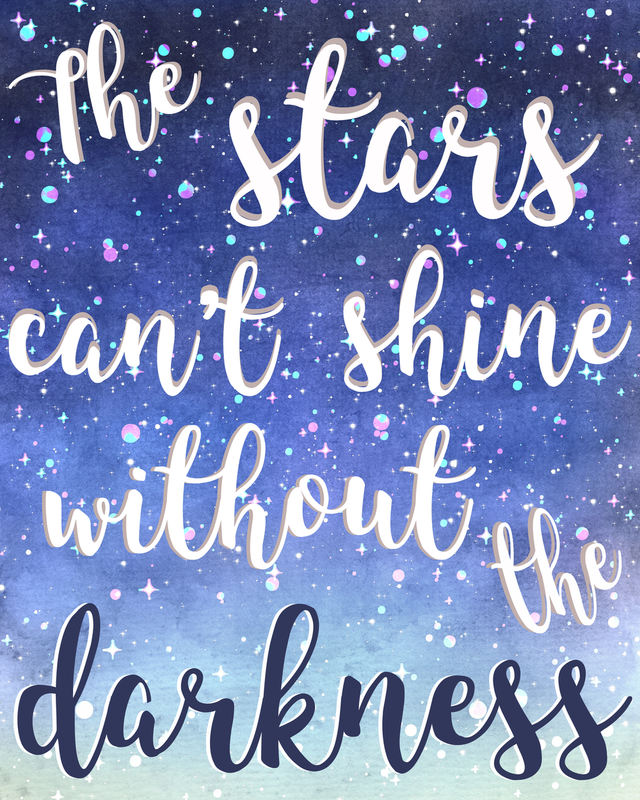 Hi there, today I have for you a new printable 8x10 print that features the words "The stars can't shine without the darkness" on a watercolor starry background. I like that this reminds me that we sometimes have to face hard times in order to truly appreciate the good times. There are highs and lows in every life and it is these peaks and valleys that make life interesting and the human experience so complex. I love how this print turned out and think it would be beautiful to frame and hang on the wall or put on a mantel or side table in your home or office. Dollar Tree has cute $1 frames that I like to use to for decorating and can easily be repurposed for each season as your decorating style changes. This file is not editable and is for personal use only. Print on high quality cardstock for best results. This page prints on 8.5x11" paper, with the actual image being 8x10 to fit into an 8x10 photo frame. Colors may look slightly different when printed because everyone's computer/phone/tablet screens aren't the same. I hope you enjoy this print and it reminds you that sometimes a little darkness in our life is okay because it gives the stars a chance to shine. Check out other free prints available on our site and happy decorating!